Godzilla vs Hedorah, Polish film poster (1972) | 'TAIN'T THE MEAT… IT'S THE HUMANITY! Time for one more Polish Godzilla poster and then we’re done. Godzilla Vs Hedorah (or Godzilla vs the Smog Monster as it was called in the US) was released by Toho Studios in 1971, and was the 11th film to feature the hugely popular monster. But unlike previous efforts this movie had a strong environmental message as the ‘villain’, Hedorah, gains his strength from Earth’s pollution. 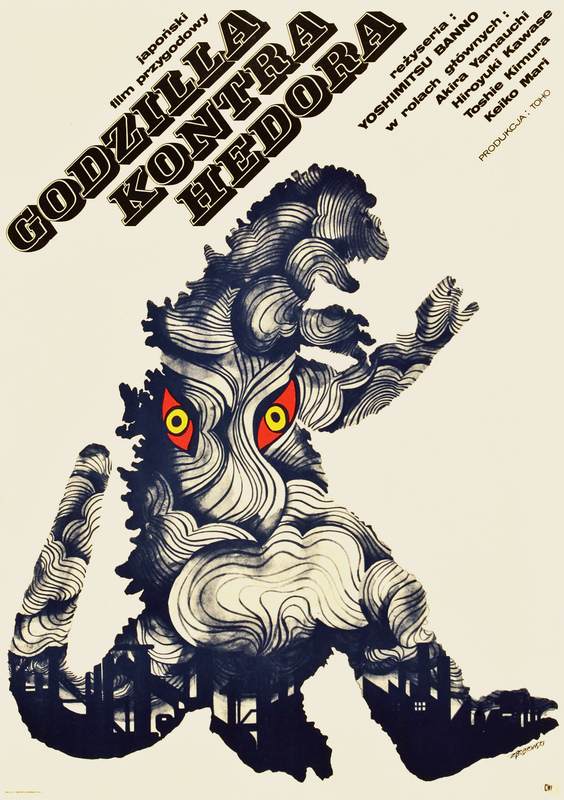 The film was released in Poland the following year (under the title Godzilla Kontra Hedorah), for which designer Zygmunt Bobrowski created this arresting poster. Bobrowski’s design featured an image of Godzilla filled with smog that’s being belched out from factories, while a pair of devilish eyes stare out at the viewer. It’s a simple yet evocative design and works wonderfully well. Bobrowski was responsible for other movie posters during the late 1960’s and 1970’s and this ranks as one of my favourites, although his poster for Ken Loach’s Kes is also well worth checking out.